PhD Thesis entitled: “A Contribution to the modelling of Agent/Environment interaction: stochastic modelling and parallel simulation”. 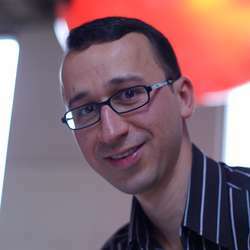 Makram Bouzid is a researcher within the IP Platforms Research Program - Scalable Data Processing Activity - at Alcatel-Lucent Bell Labs in Nozay, France. He received a Ph.D. in computer sciences from Henri Poincaré — Nancy 1 University, France. He also obtained an engineering diploma in the same field from the National School for Computer Studies (ENSI), Tunisia. His research activities are in the areas of artificial intelligence and the application of AI technologies for the development of distributed and intelligent applications for mobile and non-mobile users. Dr. Bouzid has worked on agent and multi-agent design and simulations, as well as on agent-based services (generic services, service composition, and service aggregation). He also worked on personalization (machine learning, reasoning, user profiling, recommendation systems) and on privacy-preserving personalization technologies. His current activities are focused on root cause analysis in cloud environments. Aghasaryan, A., Bouzid, M., Kostadinov, D. and Nandi, A. (2014), Exploring the Impact of LSH Parameters in Privacy-Preserving Personalization. Bell Labs Tech. J., 18: 33–44. Aghasaryan A. , Bouzid M. , Kostadinov D. , Picault J. , Senot C. (2014), Group Representation and Profiling. ENSA encyclopedia (Encyclopedia of Social Network Analysis and Mining), Springer. Aghasaryan, A., Bouzid, M., Kostadinov, D., Kothari, M., Nandi, A. (2013), On the use of LSH for Privacy Preserving Personalization. IEEE TrustCom-13 Conference (The 12th IEEE International Conference on Trust, Security and Privacy in Computing and Communications), 16-18 July, 2013, Melbourne, Australia. Senot C., Kostadinov D., Bouzid M., Picault J., and Armen A. (2011), Evaluation of group profiling strategies. In Proceedings of 22nd International Joint Conferences on Artificial Intelligence (IJCAI 2011), Best Paper Track, Barcelona, Catalonia (Spain), July 16-22, Barcelona, Spain, Best Paper Track. Nandi A., Aghasaryan A., Bouzid M. (2011), P3: A Privacy Preserving Personalization Middleware for recommendation-based services. In Proceedings of 4th Hot Topics in Privacy Enhancing Technologies Symposium (HotPETS 2011) held in conjunction with PETS 2011, Waterloo, Canada. Senot C., Kostadinov D., Bouzid M., Picault J., and Armen A., Bernier C. (2010), Analysis of Strategies for Building Group Profiles. In Proceedings of 18th International Conference on User Modeling, Adaptation, and Personalization (UMAP 2010), June 20-24, Big Island of Hawaii. Best Paper Award. WO2014012627 A1, Aghasaryan A.; Bouzid M.; Kothari M.; Nandi A., Method and apparatus for privacy protected clustering of user interest profiles, 2012. WO2012146508 A1, Nandi A.; Aghasaryan A.; Bouzid M., Privacy protection in recommendation services, 2012. EP2541856 A1, Pergament D.; Picault J.; Bouzid M., Method for multi-tag cloud views of email, 2011. EP2463788 A1, Pergament D.; Ghorbel M.; Bouzid M.; Aghasaryan A., System for selecting key words, method and database implementing such a system, 2010. EP2306686 A1, Bouzid M.; Kostadinov D.; Aghasaryan A.; Betge-brezetz, S., Device and method for an automated gestion of users' identities and profiles of communications equipments, 2010. WO2011045162 A1, Picault J.; Kostadinov D.; Bouzid M., Device for determining potential future interests to be introduced into profile(s) of user(s) of communication equipment(s), 2010. EP2270741 A1, Bouzid M.; Kostadinov D.; Bernier C.; Aghasaryan A., Personalized exposure strategy, 2009.